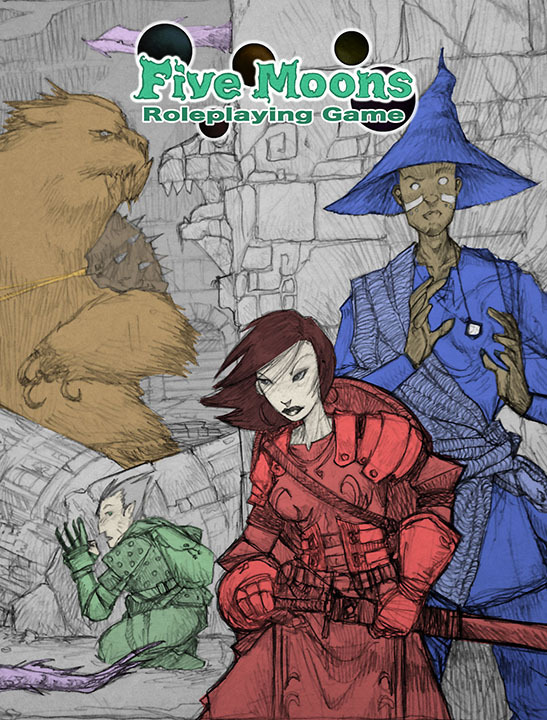 Five Moons RPG is a tabletop fantasy roleplaying game by Sean K Reynolds. Its play style will be familiar to fans of D&D and the Pathfinder Roleplaying Game, but colored by Sean’s experiences in the tabletop, card, and video game industry over the past 19 years. Create a book that’s easy to read, understand, play, and reference, like the Pathfinder RPG Beginner Box (a product Sean wrote). Elevate martial characters to have parity with spellcasters, but still maintain fun and distinct flavor for each class. Reward roleplaying, adventuring, and social interaction instead of focusing on damage output in combat. Make characters less dependent upon their gear to survive and succeed. Create a longer play experience in the leveling “sweet spot” (the D&D/PFRPG equivalent of level 6 to level 12). Allow characters to level more frequently so they don’t remain exactly the same for many game sessions. This game is being funded with a kickstarter campaign (running from September 23 to October 28, 2014). You can find more information about Five Moons RPG on this blog, the Five Moons RPG page on Facebook, and the Five Moons RPG Twitter feed. Thank you very much for your support and we look forward to sharing news about this new game over the next few months. Hey… I went on to you KickStarter a short time ago to support it but when it came time to do payments I saw that the only option you offered was Amazon payments. I don’t do any business with Amazon due to their unfair trade practices and abusive labour record. I won’t make a purchase from them or using their services for ethical reasons. Unfortunately, since their payment service was the only one you offered, this affects you as well. Doing business with unethical companies makes one complicit in their actions to some degree. Your project looks interesting and if you decide to offer some other means of payment then I would support it. Hi Sean, I’ve read about the Five Moons RPG Kickstarter too late to contribute: I’ve been really enjoying what I’m reading so far about it. When they are released, will the rulebooks be available also to non Backers? I’d really like to buy them! I really like the cooperative flavor and mechanics of the game, and the customization in class building! Have a nice life, a happy gaming, and keep up with the good work! The rulebooks (and the other books doing for the game, such as the adventures) will be available for purchase even if you aren’t a kickstarter backer. I’m estimating the PDFs will be available in June 2015, and the print books in August 2015. You’ll be able to buy them from my webstore, online sellers such as DriveThruRPG, and (assuming all goes well) at game stores. I’ve been following the Five Moons discussions through the Kickstarter updates and am intrigued by the design choices, which I think are very well considered all around. I have noted that one of your considerations in 5M is to promote and reward roleplay and social interaction- have you considered including rules for promoting party cooperation and strategy? The typical rpg generally focuses on individuals building their own characters and then bringing those abilities to the adventure and trying to mesh them with the rest of the party. What I’m thinking about would be something whereby players, when building and leveling characters, would be doing it in a more cooperative manner- selecting abilities that synergize with one another, or perhaps something where a party would get “team feats” as it levels, allowing all players to get some benefits due to strategic cooperation, without having to expend a valuable (and in many cases rare) class feat to select a teamwork feat, such as is done in Pathfinder. It’s something that occurred to me this past week while working on trying to design an item for RPG Superstar, and I realized I hadn’t seen done too often in rpgs, but might be have possibilities. Must have missed that post – but I’m glad to see this!